Supporters of Syria’s President Bashar al-Assad are wailing and his opponents gloating over the killing of three men at the heart of his crisis team. Gen Hassan Turkmani, assistant to the vice-president and head of the crisis management office. Two other senior officials -- Interior Minister Mohammad Ibrahim Shaar and National Security Bureau chief Hisham Ikhtiar -- were among the wounded. In neighboring Lebanon, Hezbollah leader Hassan Nasrallah condemned what he termed a targeted killing: "We are going to miss them and we offer our condolences to the Syrian leadership and the Syrian army." The question is what next? The debate will slump to tell tales and scenarios ranging from conspiracy theories to long hands that reached the higher echelons of government. 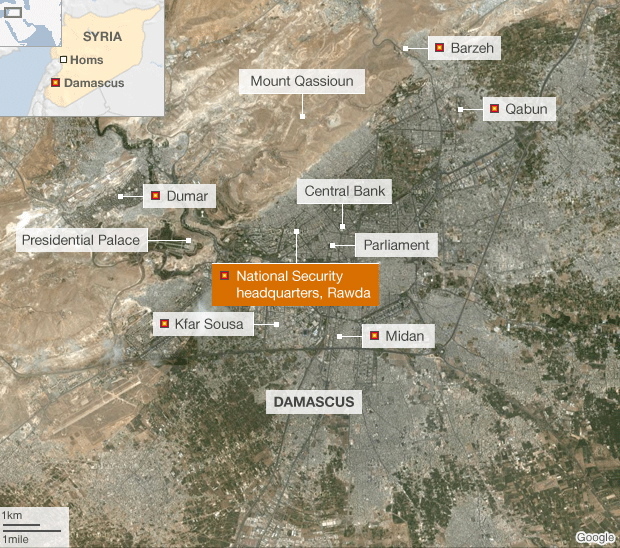 In the end, however, the incident remains a potent security operation that can be mounted by a small group, particularly that security measures surrounding leadership command centers are not as tight as imagined, given Syria’s current circumstances. Assuming the perpetrators were professional, their mission would have been made so much easier by information provided by a global web of intelligence networks. Their aim is to bring down the regime by killing its icons. It’s been months since the Syrian leadership was forewarned of security operations targeting security leaders and even President Assad personally. And success of yesterday’s bombing underscores the perseverance of the enforcers. It also gives added evidence that global stakeholders and some Syrian opposition groups are bent on a bloody ending to the crisis. Opponents of the regime in Syria and their Arab and international backers simply don’t want a political settlement. All they want is to eradicate the regime. For them, the war currently underway is an existential war. Consequently, they are not interested in either political initiatives or dialogue. Among those killed in yesterday’s Damascus outrage was someone who was the ceaseless focus of security, political and media scrutiny. He was Assef Shawkat, the most controversial figure by virtue of his range of key positions. The man’s demonization by the United States, Israel and their lackeys in the region did not stop for one day. He was a true partner of the (Hezbollah) Resistance in Lebanon. He never waited for a demand or recommendation from higher up to help the Resistance. He was a central player in the (July 2006) war by Israel. Throughout the fighting, he remained seated in the central operations room on orders from President Assad. He supplied the Resistance with the weapons it needed, chiefly quality rockets. Together with the late Gen. Mohamed Suleiman, who Israel assassinated on Syria’s coastline in 2008, Assef Shawkat spent weeks following up the delivery of quality weapons to the Resistance, smoothing the latter’s way to rout Israel. In his front-page comment, Abdelbari Atwan, publisher and editor-in-chief of the pan-Arab daily al-Quds al-Arabi, zooms in on the whodunit. He begins by recalling the January 1986 “massacre with tea” in Aden by President Ali Nasser Muhammad of his rivals. A violent struggle ensued and Ali Nasser fled to North Yemen before settling in Damascus as a protégé of Hafez Assad. Atwan says he evokes the incident after following news of the “mysterious” bombing of the crisis team meeting at the national security headquarters in Damascus. Atwan says talk is rife of both West and East condoning a palace coup in Damascus. “There are also rumors of Assef Shawkat having been in contact with Paris for years and that he may have been instrumental in smuggling out Manaf” to Paris.